Dr. Seetha Mathis, “a thirty-five year-old, half-Indian, half-Caucasian professor of physiology at the University of Mississippi,” seems to have collected a plethora of men who are evil, weird, or just plain creepy. One, or maybe more, is stalking her. And if that’s not bad enough, her 13-year-old daughter is suffering from what appears to be PTSD as a result of a least one of these men. A wannabe Michael Crichton-esque psychological thriller, Living Memories combines evil, weirdness, and creepiness to form the first of these men: Dr. Gregory Poindexter. Troubled, but brilliant, Dr. Poindexter, known to everyone as “Dex,” is Seetha’s post-doc research associate. There’s also Seetha’s ex-husband, Rodney, freshly out of jail. Could he be the one stalking her? Or is it skeevy and goofy Robbie Obergon, Seetha’s student worker who seems to be totally smitten with his professor? And what about Vince Bonamo, Dex’s evil roommate? His family has ties to the mafia. With four men like these, Living Memories would become nothing more than a study of misandry if not for the steady and consistently heroic Detective Jonathon Theodore Fox who enters the picture while investigating the brutal murder of a male student. It is obvious from the moment Fox shows up on the pages that not only will he save the heroine from these men, he will also save her from a life of loneliness. But Fox falls short on saving this novel. As the story unfolds, Dex becomes increasingly obsessed with the notion that traumatic memories can be copied and spread from person to person like viruses. Other than the thrill of researching a wild hypothesis, it’s never quite clear why he wants to do this. The unliterary aspect of the writing might be forgiven if at least the story was gripping. Complicated by the teenage daughter’s mental issues, the story gets bogged down and almost falls from thriller to fantasy when Seetha’s daughter gets placed in a behavioral unit (mental ward) for four weeks from one known “cutting” incident. If only it was truly that easy to get a loved one into treatment. If only it was that easy to keep them there. The standard stay in any mental health care facility is easily one fourth (if not less) of that time. Physician, heal thyself takes on a literal meaning when Seetha subjects herself, and even her child, like guinea pigs to Dex’s misguided research. At this point, she loses all credibility. It’s hard to imagine what Detective Fox could possibly see as worthy of saving. Genre fiction is formulaic because it works—it satisfies and gives readers what they want. 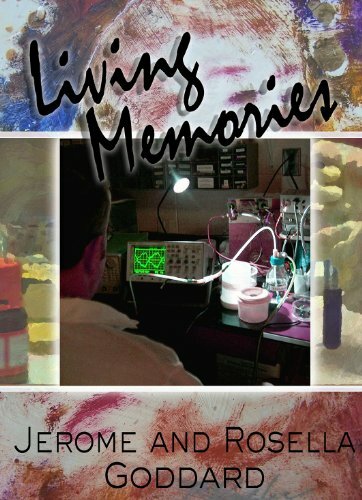 Living Memories does an adequate job at the overall formula. But sometimes it’s more satisfying to be left wanting. Sometimes not being fully satiated makes it impossible to let go of a book. Formulas have their place, but sprinkle in surprise, shocking intrigue, uncomfortable innuendo, complicated three-dimensional characters—then genre fiction can go places unimaginable, keep the pages turning, make the heart beat in anticipation. Authors Dr. and Mrs. Goddard never quite accomplish the literary magic necessary for exceptional writing, nor do they spin a tail that enthralls. Living Memories is not without merit. It’s a good choice for those wanting a harmless, quick summer read. Some interesting issues are bandied about. The “science” reads as plausible. Perhaps the most complex and interesting character is Dex, and ambivalence toward the bad guy is always a plus in a psychological thriller. The authors should be commended for their collaboration; there are not many married couples who are capable of putting their heads together and successfully pulling off a respectable first novel. Let’s hope they were just warming up on this one.